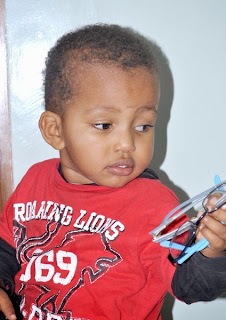 In August 2011 we were blessed with our second child Sennai. Though born very healthy, his mother soon noticed a strange looking spot in his left eye. On being taken to the only eye hospital in Eritrea, the doctors assured that the spot might clear out subsequently. However, when the child was 3 months old, he developed secondary glaucoma that caused acute pain which made him suffer continuously for two days. The doctors then prescribed certain eye drops to ease the IOP and relieve the child of the pain. 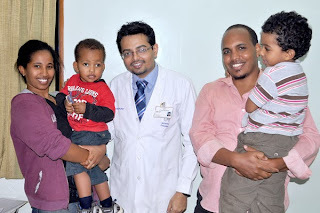 At the eye hospital in Eritrea the doctors however, did not completely rule out retinoblastoma. It was a nightmare. For 30 days, I stopped working and started hunting for internet cafes to do a bit of research on the matter. We decided to look out for places outside Eritrea for treatment. However, leaving the country was a challenge as one needed special permission from the Ministry of Health. Finally, when Sennai was 4 months old, we found ourselves in UAE Dubai and headed to City Hospital. On learning that there were no specialists in Pediatric Ophthalmology, we visited Moorefield’s Eye Hospital in Dubai Healthcare City where on further investigation, the two consultant doctors came to the conclusion that it was a Peters Anomaly. The hospital however quoted a cost of 60,000 Dirhams (a little more than 16,000 USD) for the surgery; with subsequent treatment to cost another 1000 USD. This cost was truly prohibitive and the doctors were also not conclusive with their diagnosis. But they ruled that it was certainly not a case of retinoblastoma. For me as a father, this was a great relief and worth all the trouble and expenses we had to bear to travel to expensive Dubai. Considering the cost and at the recommendation of family and friends and my own research, we headed to Hyderabad in India. We reached LVPEI on February 5, 2012. Once here, Dr Muralidhar, Dr Subhadra and another glaucoma specialist examined Sennai under Anesthesia. The diagnosis was Pseudo Peter's Anomaly, a rare condition that needed surgery. This was the worst nightmare a parent could go through. The decision to allow a sharp blade to cut the eyes of a 5 months old child is not easy. Only a parent who went through the same experience can understand it. At that point, everything becomes questionable. So as parents, we confronted the hospital with the bold question of why should we trust this doctor? We even asked them to convince us of the abilities and experience of the doctor who was designated to do the surgery. The personnel at LVPrasad were patient enough to explain everything to us, and to give us as much information as we needed regarding the experience, talent and reliability of the doctor who was designated to do the surgery. Armed with such information, we spent a night without any sleep. A decision had to be made. The next morning (February 6, 2012), we agreed for the surgery. This led to the longest 3 hours of our lifetime. The last minute of the 3 hours is one of the moments I am most thankful to God. We finally got to see our son, with no pain, with his eye covered, but peaceful. To the surprise of the doctors, the child was very patient and very cooperative. In fact they said he did not even cry till he got sedated. Never did he cry or tried to remove the patch from his eye after the surgery. For me, this is the deed of God. God gives us challenges to overcome, but He also accompanies them with miracles. Three weeks, down the road, Sennai’s wound recovered without any complication. Two years after his surgery, Sennai came to Hyderabad on his third trip to India. In this visit, we are told that, the child is improving well.